Stock # 10900, 6.7L Straight 6-Cyl Engine, Automatic, 15928 mi. 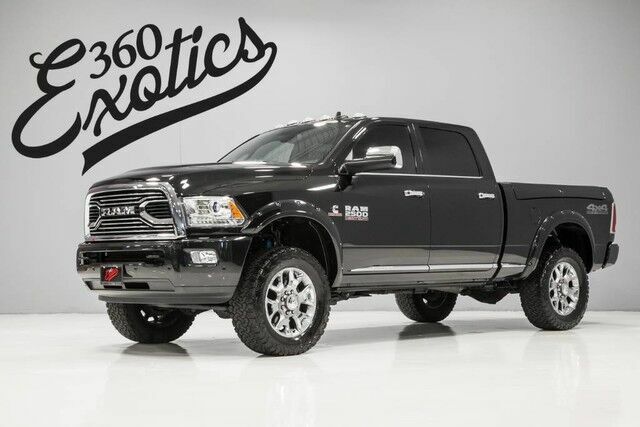 360 Exotics has a wide selection of exceptional pre-owned vehicles to choose from, including this 2017 Ram 2500. This Ram 2500 Limited's level of quality is not meant for just anyone. It's meant for the person who strives for a classy, comfortable, and luxurious car. This vehicle comes with 4WD for better traction on unstable surfaces, like snow and dirt to give you the edge over anything you might encounter on the road. The incredibly low mileage and painstaking upkeep on this Ram 2500 makes it a once-in-a-lifetime deal that won't last long! Call us today to reserve your test drive! Ram 2500 models are intended for the most extreme personal-towing needs, while the 3500 models are aimed at heavy commercial use by ranchers or construction crews. With the diesel model's gains in fuel efficiency, as well as other maintenance-related improvements, running costs should be down versus these trucks' predecessors. Even compared to the other latest heavy-duty trucks, the Ram 2500 and 3500 HD models have some of the best-appointed, most luxurious and most attractive interiors, picking up much of the look and some of the high-line materials from the latest light-duty Ram trucks.